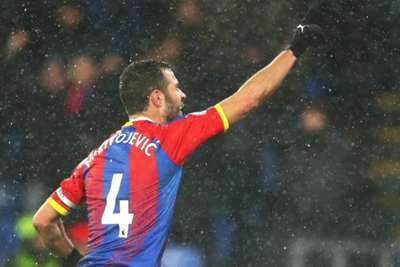 Crystal Palace captain Luka Milivojevic scored a fine first-half winner to earn a 1-0 Premier League victory over Leicester City at Selhurst Park. Milivojevic lit up a scrappy affair on Saturday with an impressive long-range strike shortly before half-time, and that proved enough to earn his side only their second win in 12 top-flight games and their first in 14 attempts without Wilfried Zaha. The closest Leicester came to an equaliser was when Jamie Vardy had a shot tipped onto the post with 11 minutes remaining, with Claude Puel's men having now lost three straight Premier League games against Palace. With goalkeeper Wayne Hennessey injured, Vicente Guaita was handed a Premier League debut by Roy Hodgson and he survived a scare when Vardy – who went on to tap into an empty net – dispossessed him, only for referee Michael Oliver to blow for a foul. The former Valencia shot stopper then kept out a Vardy header, allowing Palace to go on and take the lead six minutes before the interval. After being fed by Andros Townsend, Milivojevic took a touch before sending a superb curling strike beyond Kasper Schmeichel from over 25 yards out. Rachid Ghezzal replaced James Maddison at half-time, but it was Demarai Gray who was off target with three attempts early in the second half, the last of them a poorly scuffed effort wide to end what had been a promising solo run. Ghezzal fired narrowly wide from a Gray cross, and Vardy then thought he had equalised when set up by substitute Kelechi Iheanacho, only for Guaita to impressively push his left-footed effort against the woodwork as Palace survived. Palace came into the match with a two-point gap on the bottom three, and that advantage now sits at five after a vital result in front of their own fans. With back-to-back home wins and a resilient display, Roy Hodgson now has something to build on going into the busy festive period. Leicester, meanwhile, drop out of the top half of the table and have just one win in six, their momentum stalling with some tricky games awaiting them in the weeks ahead. It was a wonderful winning goal by Milivojevic, who had last week lamented the character of his side after they failed to hold their lead in the derby defeat to West Ham. This time they held on to the advantage. He led by example with a superb strike to take his tally to 16 Premier League goals since his debut in February 2017 – not a bad return for a midfielder, and more than any of his team-mates, including the talismanic Zaha, across that time. 16 - Since his Premier League debut in February 2017, Luka Milivojevic has scored more goals in the competition for Crystal Palace than any other player. Rocket. Over the course of his reign, Puel has often faced calls to use Gray more. He did so here, with the winger starting and playing 73 minutes, but his impact was not a positive one – three attempts off target, and just one chance created, a display which may have the manager pondering other options in what is one of the stronger squads among the mid-table sides. - Crystal Palace have won and kept a clean sheet in each of their last three Premier League games against Leicester City, doing so against a single team for the first time since April 2014 (Aston Villa). - Leicester have lost three consecutive games without scoring against an opponent in the Premier League for the first time since April 2002 (six in a row against Manchester United). - Palace enjoyed their first victory without Wilfried Zaha since beating Sunderland 3-2 on September 24th 2016. - The Foxes are without a win in their last 10 Premier League visits to London (D4 L6), since a 3-2 triumph against West Ham in March 2017. - Luka Milivojevic's goal was only his third out of 16 scored in the Premier League not to come from a penalty (12) or a direct free-kick (1). - Andros Townsend has been directly involved in three goals in last two Premier League games for Palace at Selhurst Park (1 goal, 2 assists), one more than he managed in his previous 14 (2). Palace are away to Manchester City next Saturday, the same day as Leicester take on Chelsea at Stamford Bridge. Before that, though, Pep Guardiola's side will have travelled to face the Foxes in the EFL Cup quarter-final on Tuesday – two tough games for Puel's side just when consistency is eluding them.